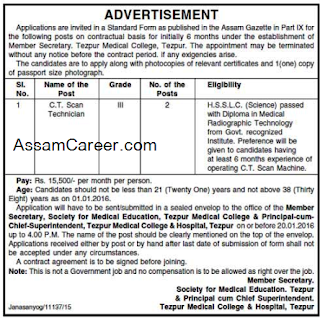 Applications are invited in a Standard Form as published in Assam Gazette in Part-IX for the following posts on contractual basis for initially 6 months under the establishment of Member Secretary, Tezpur Medical College & Hospital. Educational Qualification: HSSLC (Science) Passed with Diploma in Medical Radiographic Technology from Govt. recognized institute. Preference will be given to the candidates with at least 6 months experience in C T Scan Machine.